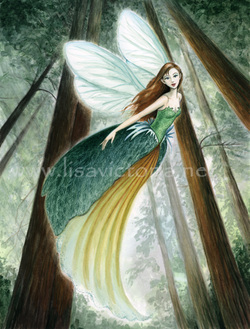 Spiritual leaders of the Elvin people, the Fae are the most magically inclined of their sisters. Fae Elves are always women, never men, and hold magical powers rivaling the dragons. It is said, at the eve of the Sealing, the Fairies, who where nearly extinct, made a bargain with the elves to forever live within a select few of their women. The elves agreed, knowing the magic abilities it would bring with them. When a Fae reaches Tier 5, 7, 10, 12, 15, 17, and 20 magic, they have 24 hours until they turn into a cocoon, from which strands of silk attaches to any living object nearby, sucking them of magic, and if they have none, draining their life. Fae metamorphosis is very dangerous, and the silk continues llooking for victims until it has nothing more to drain. Depending on the amount of energy absorbed by the strands, the Fae has a recuperation time within the cocoon of anywhere from 1 hour to 3 days. At the end of the period of time, the cocoon opens, revealing the Fae with a pair of wings resembling the tales of the ancient Fairies, a symbol of the pact they made with the Fairies long ago. Recently, the Fae bloodline within the elves has been dimishing from the lack of women; with the immense magical properties, women are often rendered sterile from the tranformation. Currently, only six know Fae remain in the world that are capable of breeding, a dire predicament indeed.